This study investigated the perception differences of IM (instant messaging) icons between users of different cultural backgrounds. Two major parts were developed for this study. The first part investigated the frequent IM icons as a basis for improving the IM user-interface design. The second part tested the use of different graphical symbols using subjects from two different populations, Taiwan and the United States. From the result, there is significant difference between the two user groups on their recognition of those frequent icons. Confusion matrices further show that some icons were thought to be associated with same functions by the two groups while some others were linked with different functions. These similarities and differences could be due to the cultural differences between the two user groups. 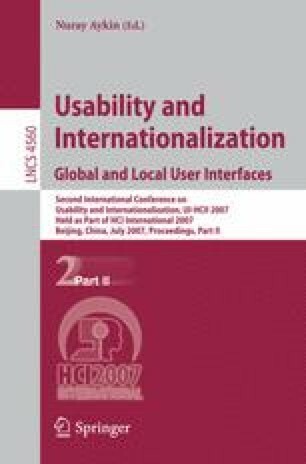 It is suggested that cultural differences should be effectively recognized by icon designers for globally accepted human computer interfaces in software products. 1.Department of Industrial Engineering, Chung-Yuan Christian University, 200, Chung Pei Rd., Chung- Li, Taiwan 32023, Email:hsiang@cycu.edu.twR.O.C. 2.Department of Applied Linguistics and Language Studies, Chung Yuan Christian University, 200, Chung Pei Rd., Chung-Li, Taiwan 32023R.O.C.